Recipe from Love Bakes Good Cakes, posted with permission. Confession: I’ve been holding out on y’all! 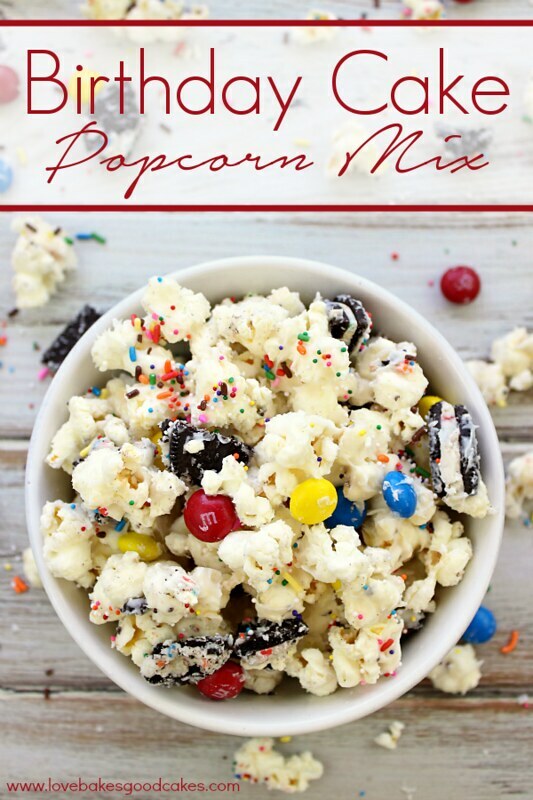 This Birthday Cake Popcorn Mix recipe is one I have been wanting to share for MONTHS now … and I am just now getting the chance to get it posted! It’s super simple to make and there is barely any “cooking” involved! Just a few things before we get to the recipe …. I used an air popper for my popcorn – but you could easily use about two bags of microwave popcorn if you prefer. I also found the Birthday Cake Flavor M&M’sat my local Cracker Barrel – but if you can’t find them, you can use plain M&M’s instead. It would be just as delicious! For the Oreo’s listed in the recipe, feel free to use Golden Birthday Cake if you prefer! I love the color contrast of the dark cookies, so I went with those! This would be perfect for grab-bags at a birthday party, movie night at home or for no real reason at all! Enjoy! 1. Pop popcorn kernels in an air popper or by using your favorite method. Pick out any unpopped kernels. Place the popcorn in a large bowl (if it isn’t already). 2. Place wax paper on two baking sheets and set aside. 3. Melt the Wilton candy melts according to package directions. Stir in the dry cake mix until thoroughly combined. 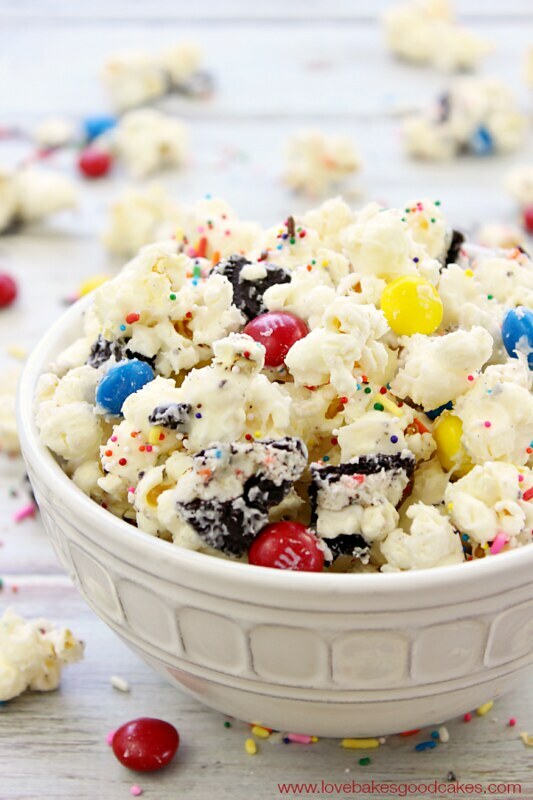 Working quickly, pour the candy over the popcorn and mix well. Add M&M’s and Oreo cookies. Mix well. Divide the popcorn mixture between the two baking sheets, spreading out into a single layer and separating the pieces (its ok if they touch a bit). Immediately shake sprinkles over the top. 4. Allow the popcorn to set until the candy melts have hardened. Break the popcorn into pieces before serving. I’m Jamie. Welcome to Love Bakes Good Cakes where I focus on family-friendly recipes. I believe food is best when shared with family and friends – and dessert is always encouraged! Learn more about her on Love Bakes Good Cakes.